Documented from the Scrolls of the Reign of Magnus Tindal and Etain, Basileus Kai Æthelmearc: the Business of The Emperor’s Court at Agincourt, 17 October, Anno Societatis L, in the Barony-Marche of the Debatable Lands, accompanied by Their Highnesses Byron and Ariella, Prince and Princess of Æthelmearc, and Their Excellences Uilliam and Constance, Baron and Baroness of the Debatable Lands. As recorded by Their Silver Buccle Herald, Kameshima-kyō Zentarou Umakai. THL Morien MacBain was called before the Emperor, who confirmed that it was still Morien’s wish to contemplate whether he would accept appointment to the Imperial Council of the Pelican. The Imperator then convened said Council, who escorted His Lordship to the place that had been prepared for him. The children of the Realm were summoned before the Emperor, who invited them to meet with Dame Hrefna Úlfvarinnsdóttir in the back of the hall, where there would be toys and games so that they would not be bored through Court. 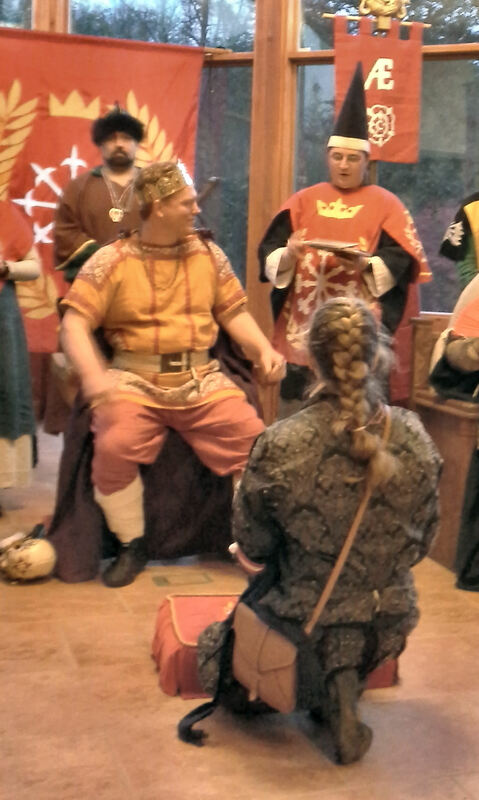 Baron Uilliam and Baroness Constance swore their Oath of Fealty as Baron and Baroness of the Debatable Lands. While Her Excellency was in Court, the Emperor bestowed upon her a token of appreciation from Baroness Mariana, the Imperial Reign Coordinator, in thanks for her service as Royalty Liaison. The Emperor allowed time for Their Excellencies to conduct the business of their Baronial Court. Takamatsu-san Gentarō Yoshitaka was called forth and recognized for having achieved a Royal Round average of 83 and therefore was awarded the rank of Master Bowman. Lord Yoshi is named a Master Bowman. Photo by Mistress Arianna of Wynthrope. 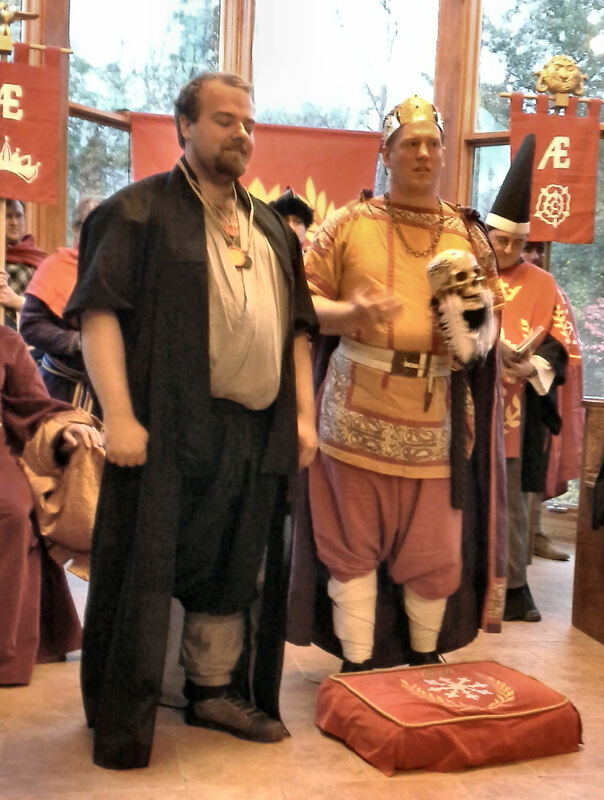 Drotin Jorundr hinn Rotinn was granted the King’s Award of Excellence for his many venues of service, including fencing, heraldry, and archery. Scroll by Lady Vivienne of Yardley. Drotinn Jorundr receives the King’s Award of Excellence. Photo by Arianna. 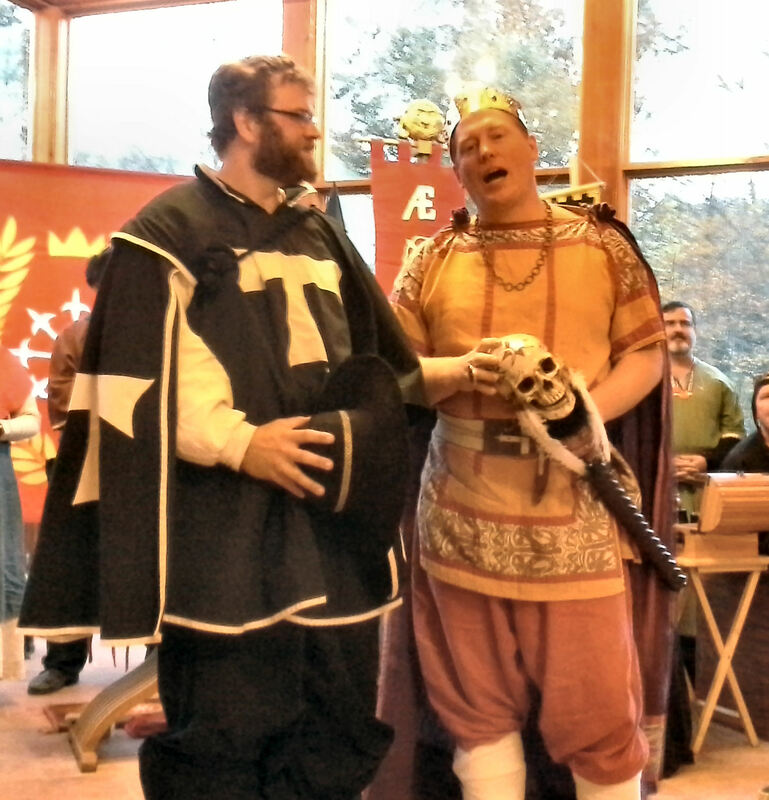 Lord Jacob Martinson was called forth and presented with a second scroll to commemorate his Award of Arms, which he had received at Pennsic. Lord Jacob receives his AoA scroll. Photo by Arianna. Lady Abbatissa Dreye de Banneberi was inducted into the Order of the Keystone for her service in helping to setup and tear down events, assisting in kitchens, coordinating potlucks, and for donating sekanjabin made by her own hand on many occasions for gift baskets and to individuals. Two scrolls were created to commemorate this event, one by Baroness Helene al-Zar’qa, and a second by Lady Mary Elizabeth Clason. Lady Abbatissa is inducted into the Order of the Keystone. Photo by Arianna. 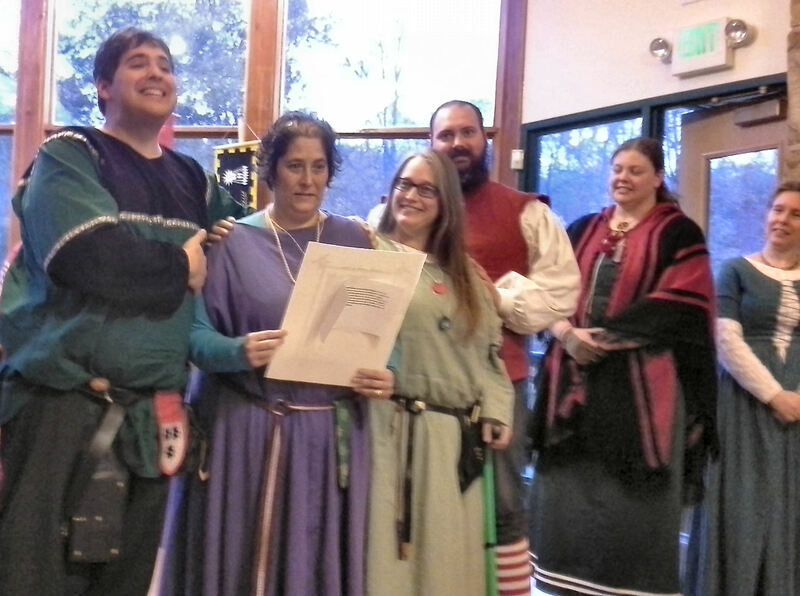 THL Margery Kent of York was recognized for her many years in the performing arts, as part of the Dismal Players, the Debatable Consort, and I Genisii, with elevation into the Order of the Sycamore. Scroll by Baroness Gillian Llewellyn of Ravenspur. The companions of I Genesii – the Greatest Commedia dell’Arte troupe in the Known World – were called into Court to celebrate Margery’s exemplary work as part of their troupe. They presented her with a scroll naming her as Zanni Emerita and forever granting her sole designation and ownership of the name of Spinetta within their troupe. Scroll illuminated by Lady Kathryn Täntzel, to be calligraphed by Kameshima-kyō Zentarou Umakai upon words by THL Elss of Augsberg. Lady Margery receives a Sycamore and is extolled by the cast of i Genisii. Photo by Arianna. THL Fiora d’Artusio was granted admission into the Order of the Golden Stirrup for her continuous dedication to the authenticity of her garb, both on and off the fencing field. Scroll by Baroness Gillian Llewellyn of Ravenspur. THLady Fiora is admitted to the Golden Stirrup. Photo by Arianna. Lady Hara Kikumatsu was Granted Arms and named to the Order of the Fleur d’Æthelmearc for her skills in researching and creating Japanese garb, dyeing techniques and braided cordmaking. Scroll illuminated by Ishiyama-roku-i Gentarō Yori’ie and calligraphed by Kameshima-kyō Zentarou Umakai. Lady Sumayya al-Ghaziyya was Granted Arms and elevated to the Order of the Fleur d’Æthelmearc for the beautiful leatherwork and Turkish garb that she creates. Scroll by Baroness Helene al-Zar’qa. Mistress Hilderun Hügelmann was inducted into the Order of the Fleur d’Æthelmearc for her research into livery collars, most recently relevant to the recent creation of the Order of Defense and its regalia. 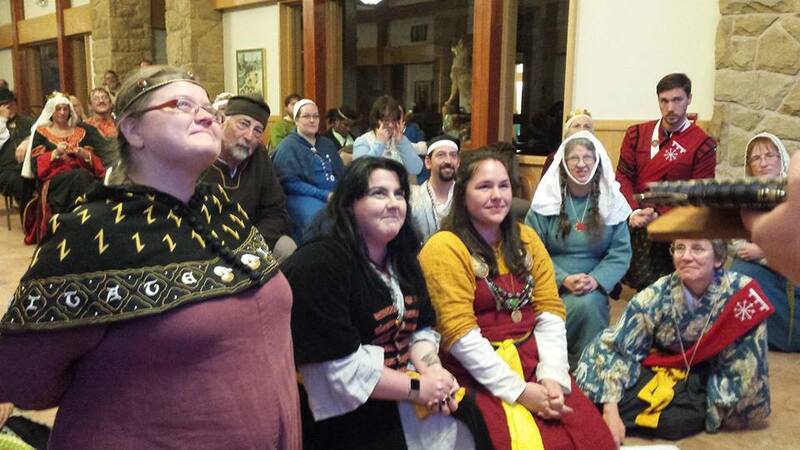 Lady Hara, Lady Sumayya, and Mistress Hilderun are inducted into the Fleur d’Æthelmearc. Photo by Baroness Constance Glyn Dŵr. 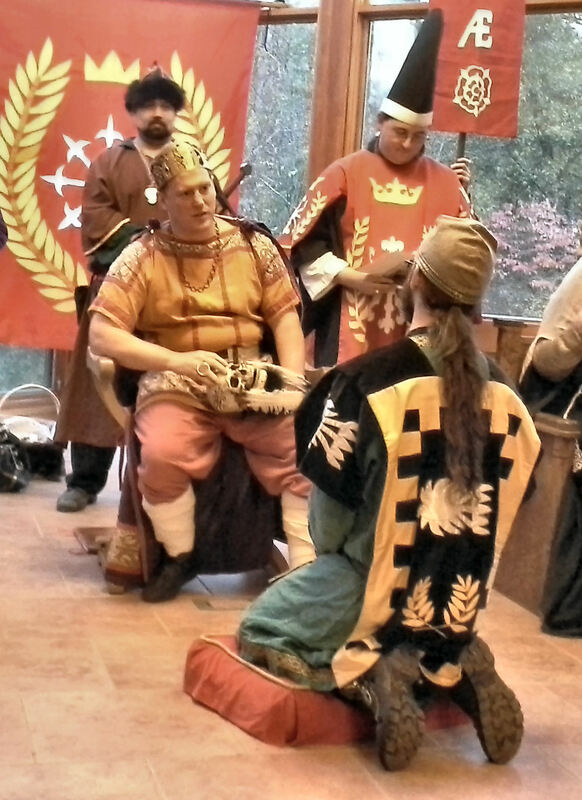 THL Morien MacBain was summoned before the Emperor, assured Him that he had in fact sat vigil as He had instructed, and that it was still his wish to take the seat in the Imperial Council of the Pelican. Duchess Tessa the Huntress, Morien’s patroness in service, was invited forth and released Morien from his obligation as her protegé. The Emperor then convened the Council of the Pelican and asked for testimony from Peers and other worthies of the Realm. Duchess Gabrielle van Nijenrode spoke of his courtesy and politeness even after countless hours of service, and of how his work in starting the Paladin’s Pantry had now spread across the Known World. Count Sir Jehan de la Marche recalled some 20 years ago when he first came to Æthelmearc and Morien became his squire, and of his service to the heavy weapons, siege, combat archery and equestrian communities since then. Master William Parris bore the words of Maestro Orlando di Bene del Vinta, who named Morien an inspiration of his for many years, and calling him an artisan, a creative genius, a servant, a warrior, kind, generous, courteous and honorable. Shishido-nagon Tora Gozen noted Morien’s continuing desire to better himself, whether it be in the realm of martial arts, bardic arts, or service. Duchess Tessa the Huntress spoke of a Blackstone Raids many years past, when she found herself in need of a combat archery marshal and found Morien already doing it, and then of a time last year when she found herself in need of a combat archery marshal, and a siege marshal, and a heavy weapons marshal, and once again found Morien already doing all of those things. The Emperor then commanded that Morien be arrayed in the regalia of a Counsellor of the Pelican, and thus Morien was presented with the Ancestral Pelican Medallion of Æthelmearc, a personal medallion, a cloak, a hat, and a horse brass bearing the badge of the Council, that he might be known as a Peer even upon horseback. His Lordship now presenting as a Counselor of the Pelican, the Emperor named him to that Council, Granted him Arms by Letters Patent and elevated him to the station of a Peer of the Realm. The Emperor accepted Master Morien MacBain’s Oath of Fealty, and words by Count Sir Jehan de la Marche, to be penned upon a work in progress by Master Morien ap Rhys, were read. 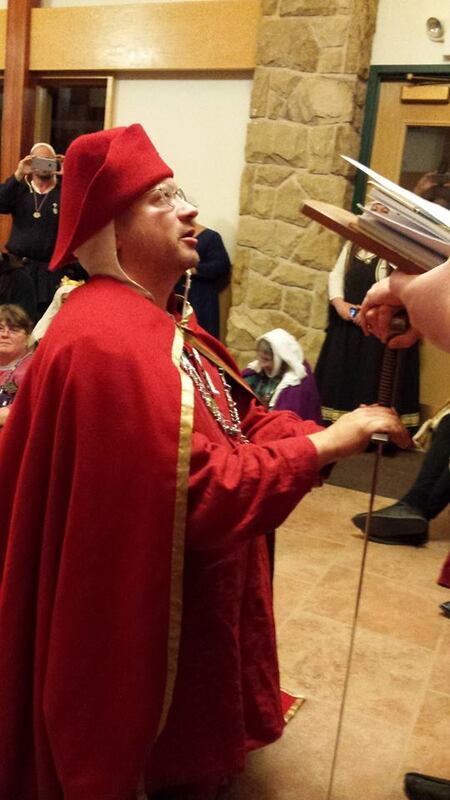 Master Morien MacBain swears his fealty as a Companion of the Pelican. Photo by Baroness Contance. 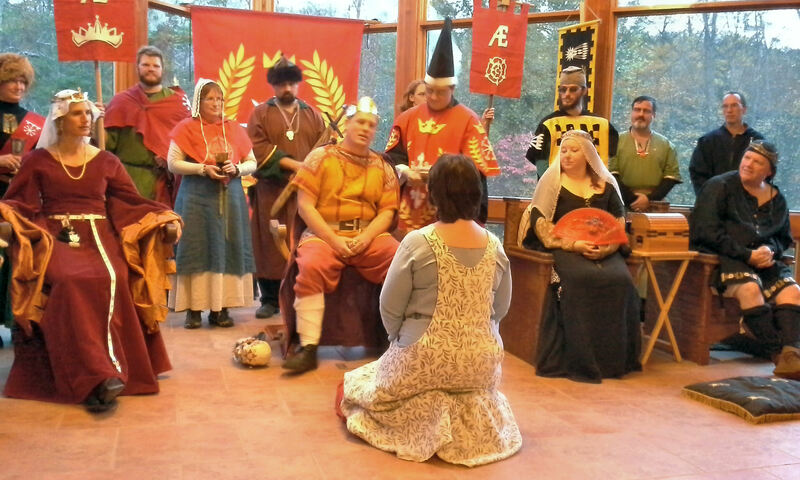 The Emperor, noting that he had been commanded by his Empress to find and recognize inspiration in her absence, invited forth Mistress Arianna of Wynthrope, Baroness Aemilia Soteria and Lady Ceindrech verch Elidir, and presented them with tokens of inspiration for their service running the day’s youth combat tournament. All those who had contributed time and effort in creating the day’s scribal offerings were invited to stand and be recognized.